We said hello and goodbye to Edinburgh. 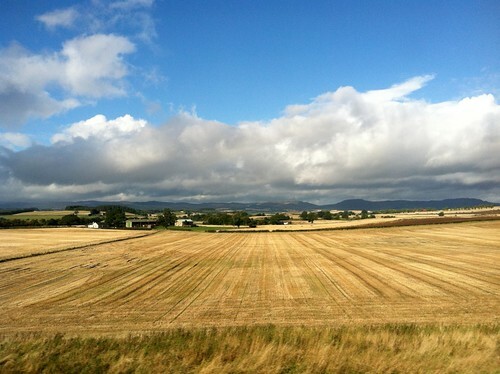 We said hello and goodbye to Inverness and the Scottish Highlands. 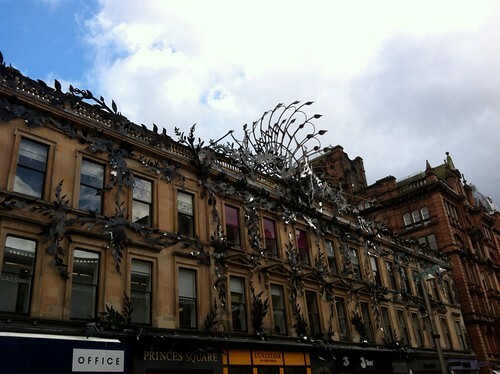 A 4 hour train ride later, we say hello to Glasgow. Our last stop in Scotland. 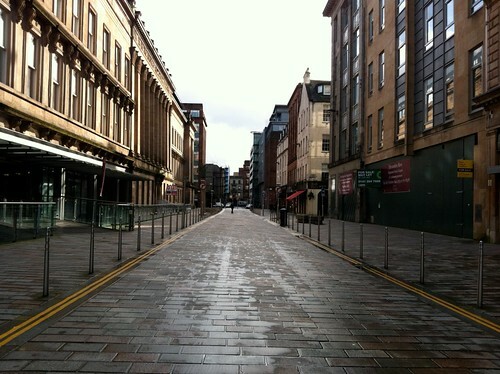 When we arrived in Glasgow, it was raining. At this point it’s expected. Before we had left for our trip, we had downloaded this awesome app called CityMaps2Go. Best $0.99 spent ever. You basically download the city maps onto your idevice, so you can reference them on the go, even if you don’t have any wifi connection. It also has a very nifty function of being able to tell you what’s available around a certain point. It saved us as we were leaving the train station and got super turned around looking for our hotel. Our hotel was actually worth a mention. 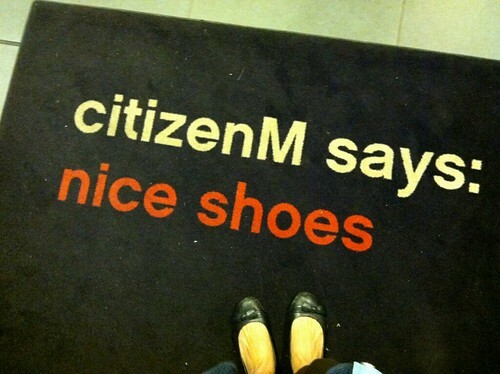 It was the CitizenM and it was pretty funky. This was the fourth hotel we were staying at during this trip. It was the third that required us to check in via computer. The rooms themselves were tiny, absolutely no more than two people per room, and those two people better be very comfortable with each other. Not because there isn’t enough room to turn around without being in each others face, but the shower situation lacked the amount of privacy us Americans are more accustomed to. Not that you could see anything, specific, but it was just a frosted sheet of glass between you in the shower (complete with rain shower fixture…sweet) and your roommate in the room. Regardless, it was worth it for a room with a super comfy king sized bed, electronically controlled blinds and sun shade and free on demand movies. First order of business after we settled into the room and finished our exploration of all the fun stuff it had to offer, was a bite to eat. Cafe Hula was just up the street from the hotel. It was just what we needed. A menu filled with a lighter fare compared to the pub food we have been stuffing ourselves with and a cozy cafe ambiance to warm us up from the rain. The two people running the place were super friendly to boot. If this was located in one of the commercial spaces in my building, I’d probably spend more time there than in my own apartment. 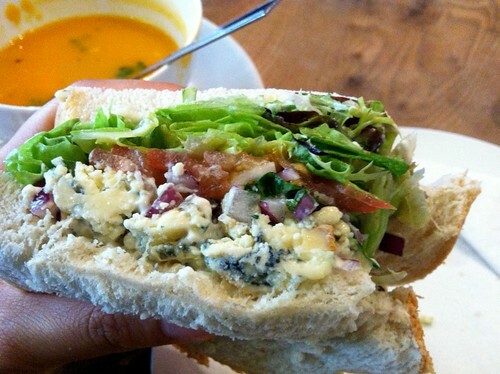 Especially if they served the Stilton with Pear Salsa and Herb Salad sandwich. After a hearty lunch, the rain had stopped and the sun was coming up. 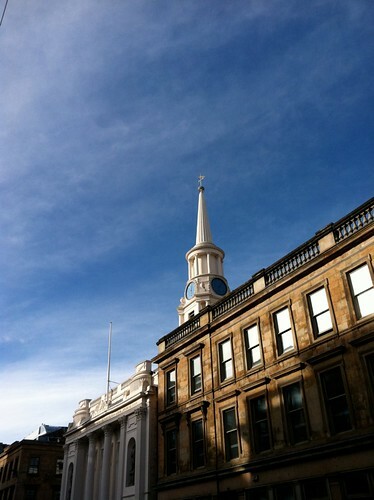 So we went for a walk down Style Mile and through Merchant City. We admired the architecture and wandered through Marks & Spencer, picking up a few food items to tote home. However, we were both pretty exhausted from the past few days, so we retired early, back to the hotel and took in a movie instead. Can’t let a super comfy king sized bed and on demand movies go to waste! As the sun rose again over Glasgow, we gathered our luggage again and made our way to the train station and headed for London. 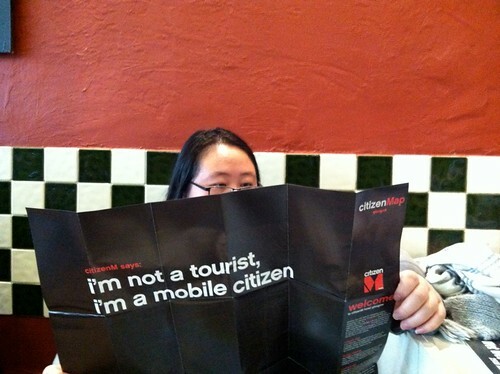 This entry was posted in Travel, Uncategorized and tagged Cafe Hula, CitizenM, Glasgow, Stilton. Bookmark the permalink. That sandwich looked super good. Can’t wait to read about Paris! It was super good! I’m going to have to try to replicate it one day. Although, I found that the sandwich bread over there is way better than the sandwich bread here. Stay tuned! I’m working on the Paris post!